The present work is an analytical philosophic enterprise dealing with a specific topic, viz. 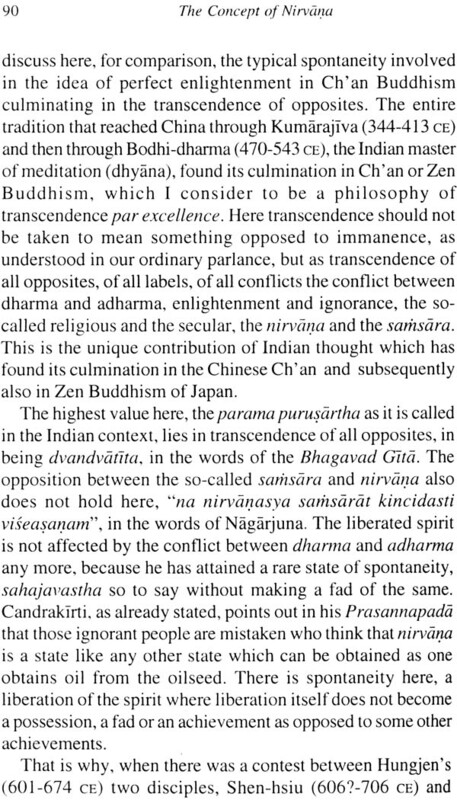 nirvana, in Candrakirti’s Prasannapada, which represents and is a standing testimony to the Buddhist critical philosophy par excellence. 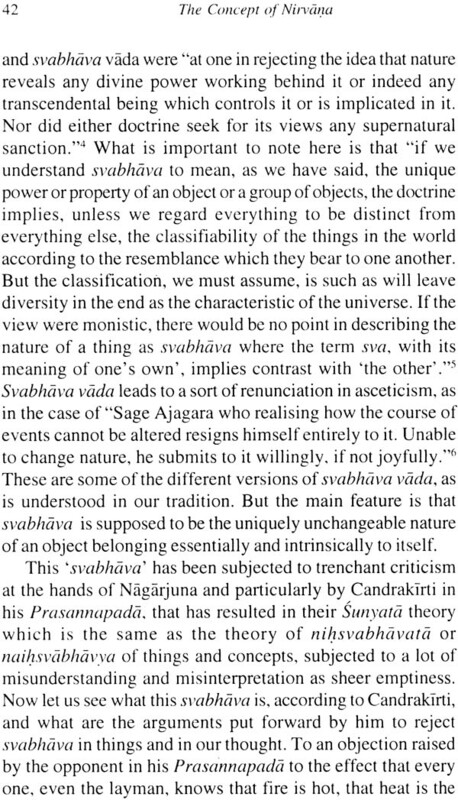 A unique revolution in the world of thought has been brought about by Acarya Candrakirti, the great Prasangika Madhyamika thinker of 7th century C.E., through his theory of nirvana as sarva/nirvasesa Kalpanaksaya (cessation of essentialist thought-constructions/speculative picture-thinking) developed in his magnum opus, Prasannapada, thus giving the idea of nirvana a novel turn, viewing it from a fresh perspective. 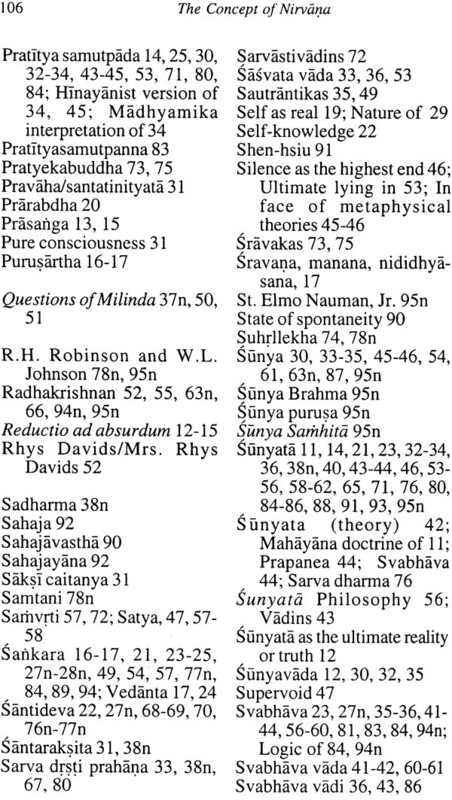 The idea may have had its basis in Mula Madhyama Karika/Madhyamaka Sastra of Nagarjuna, the unique philosophical master-mind of the world of 2nd century C.E., and of course in the enlightenment of the Buddha, the credit goes to the author of this volume, however, for bringing to the fore the genius of Candrakirti in working out the theoretical and practical implications of this idea by a rigorous analysis of the logic of essences (Svabhava) and allied concepts. 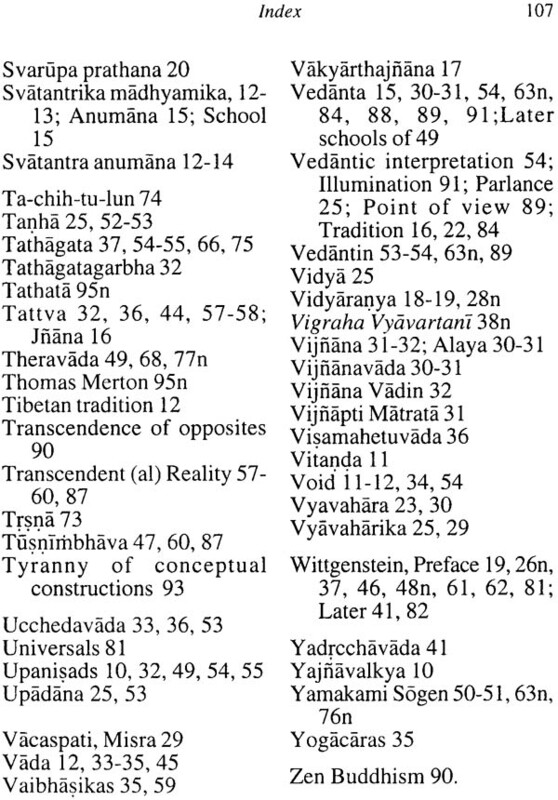 A critical and comparative study of nirvana of Prasannapada with that of early Buddhism on the one hand and of nirvana with the concept of Vedantic moksa on the other as well as points of comparison and contrast brought out with such pioneers of Western thought as Aristotle and Wittgenstein are features of special interest in the volume, meant for promoting a greater clarity in understanding. 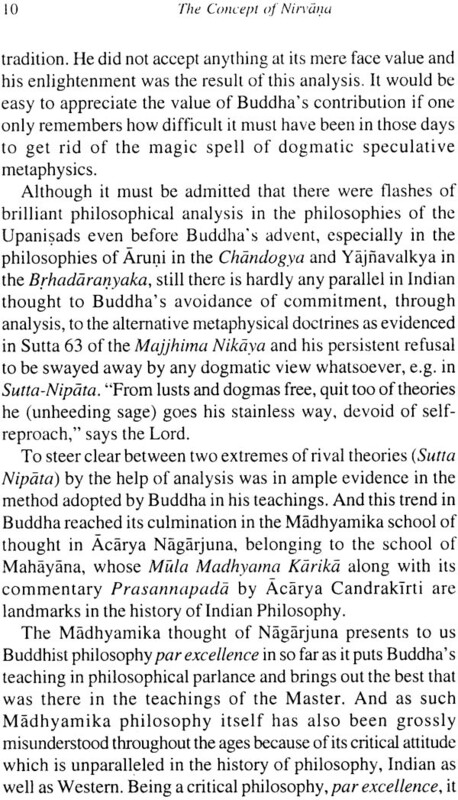 The volume, primarily aiming at an understanding of the Buddhist concept of nirvana in its proper perspective, through eradication of certain earlier misconceptions, highlights for this purpose Candrakirti’s unique critical philosophy advocated and worked out so diligently in Prasannapada which is a significant milestone in the development of the Buddhist thought. 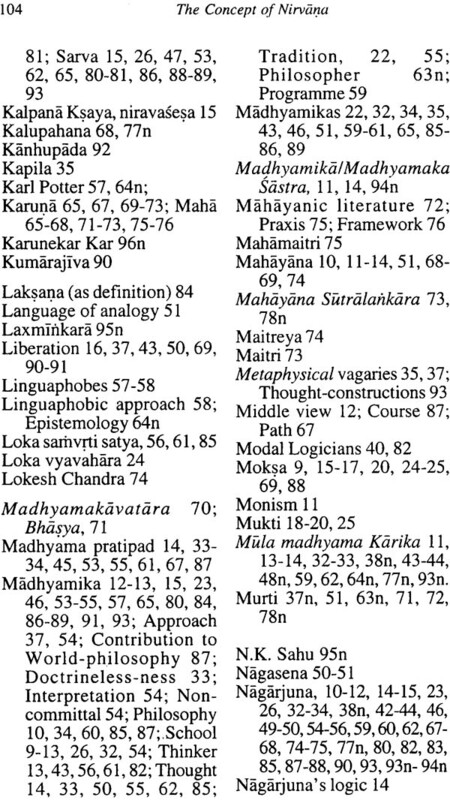 It is expected to be of interest for all scholars of Indian thought. At the same time it is likely to prove itself to be of value for further intensive research in the field. G.C. Nayak, born on 14 February 1935 and brought up at Cuttack (Orissa) was the best graduate of Utkal University in 1954, First Class First in M.A. 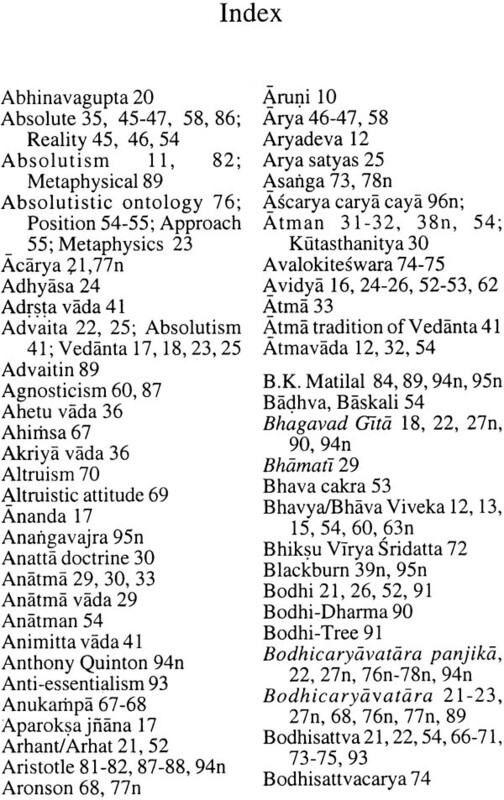 Philosophy at Allahabad in 1956 and completed his Ph.D. from Bristol University, U.K. as a Commonwealth scholar in 1965. He was Professor and Head of the Post-Graduate Department of Philosophy, Utkal University from 1978 to 1989. 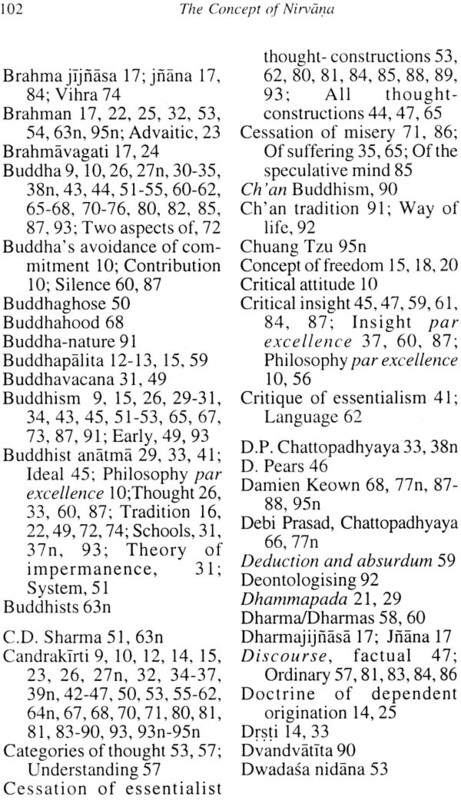 He was the Vice Chancellor of Sri Jagannath Sanskrit Vishvavidyalaya, Puri from 1989 to 1992, Visiting Professor in the Department of Buddhist Studies and Philosophy at Nagarjuna University from 1992 to 1994, and in the Department of Religious Studies at the University of Saskatchewan, Canada in 1995. He was a Senior Fellow, Indian Council of Philosophical Research during 1996-98, UGC Emeritus Fellow at BHU Varanasi during 1999-2000, and Fellow at the IIAS from 2001-04. Professor Nayak has been the General President of the Indian Philosophical Congress in 1992, and of Akhil Bharatiya Darshan Parishad in 2001. 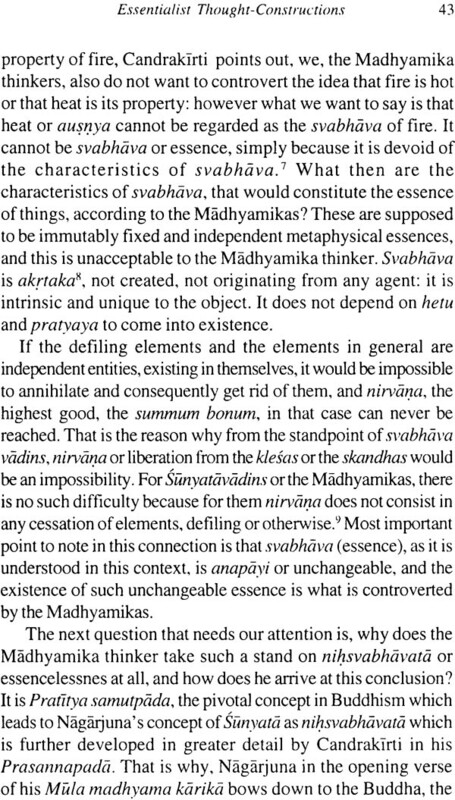 Some of his important publications include Philosophical Reflections (2nd and enlarged edition, ICPR, New Delhi, 2002), Madhyamika Sunyata (ICPR, New Delhi, 2001), Understanding Religious Phenomenon (Dharmaram Publications, Bangalore, 1997), Evil and the Retributive Hypothesis (MLBD, New Delhi, 1993). 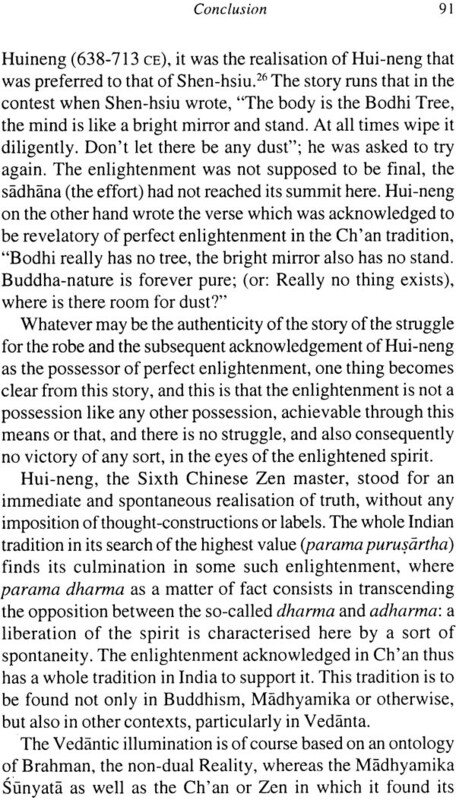 Philosophical Enterprise and the Scientific Spirit (Ajanta Books International, Delhi, 1994). 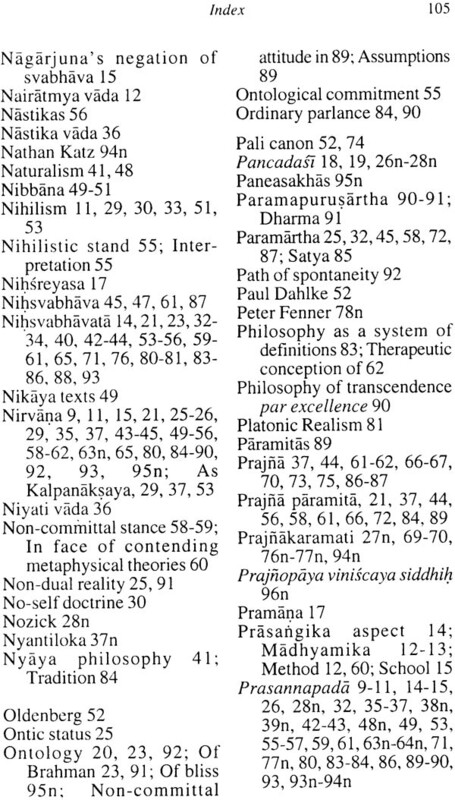 His Philosophical Reflections, first published in 1987 by the ICPR, New Delhi was awarded the Pranavananda Book prize at the Indian Philosophical Congress, 1988 session. 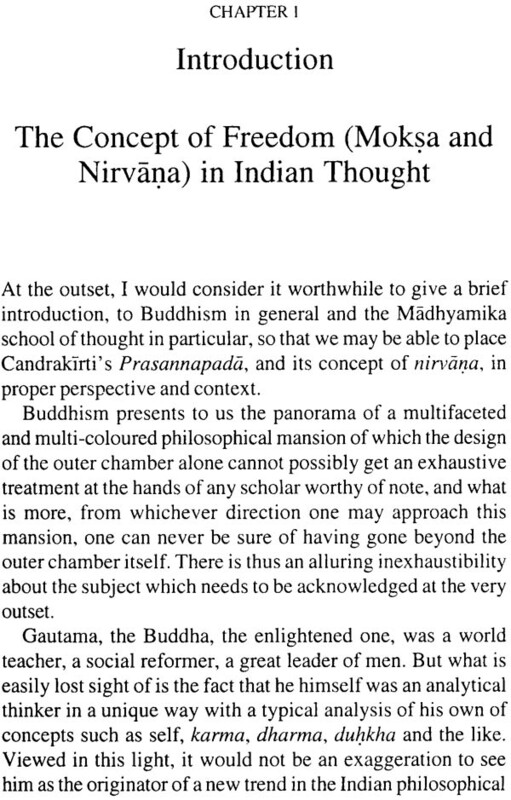 I am happy to present this completed research-project on “The Concept of Nirvana in Candrakirti’s Prasannapada” to the authorities of the Indian Institute of Advanced Study Shimla, for their kind consideration and publication. On this occasion, I express my deep gratitude to one and all at the Institute for having been kind to me in more ways than one from the very first day of my entry here as a Fellow till the last; it has been indeed a wonderful experience for me. I am particularly grateful to Professor G.C. Pande, the former Chairman, Professor V.C. Srivastava and Professor Bhuvan Chandel, the former Directors of the Institute; I do not have adequate words to express my gratitude to them for all that they have done for me in providing facilities for my research-work. Madam Chandel, who has been my friend, philosopher, and guide throughout my career as a researcher, has also been a constant source of unfailing guidance and inspiration here for me. Professor Pande’s ungrudging guidance from time to time has given me the appropriate direction in research whenever I have found myself desolate and directionaless. Shortcomings, whenever and in whichever form they are to be found in this work, are obviously and indisputably my own. My heartfelt thanks are due to Dr. S.A. Jabbar, the Academic Resource Officer of the Institute, for encouraging me throughout with his constantly helpful attitude. I also record my deep gratitude here to Dr. Debarshi Sen, Assistant Publications Officer, for taking early requisite steps for publication of this work. Ludwig Wittgenstein, one of the outstanding thinkers of the twentieth century, had stated in his characteristic style (Cf. 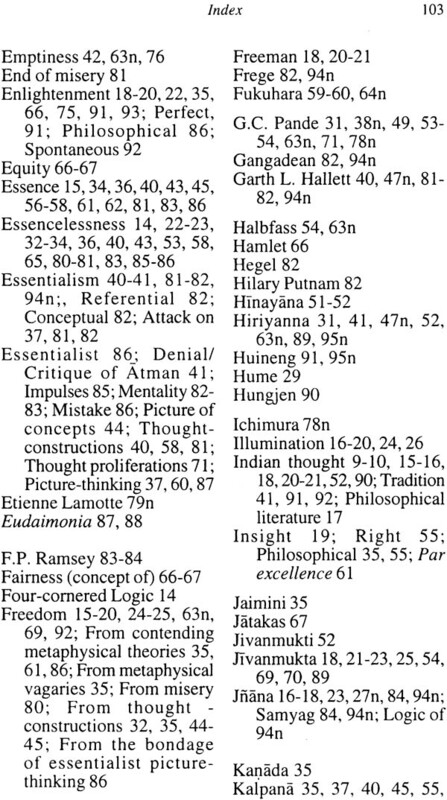 R. Rhees (ed), Recollection of Wittgenstein, Oxford, 1984, p. 81) that “Philosophy is like trying to open a safe with a combination lock; each little adjustment of the dials seems to achieve nothing, only when everything is in place does the door open”. Whether my present work is just “a little adjustment of dials” or it may perhaps hopefully contribute some what to the opening of the door for an appropriate understanding of the subject is a matter to be judged only by the learned scholars available in the field at present, and also by those who are yet to come. Here I can do no more than humbly request the learned scholars to kindly spare some of their most valuable time in going through this little work of mine for giving their constructive criticism and helpful suggestions for improvement.